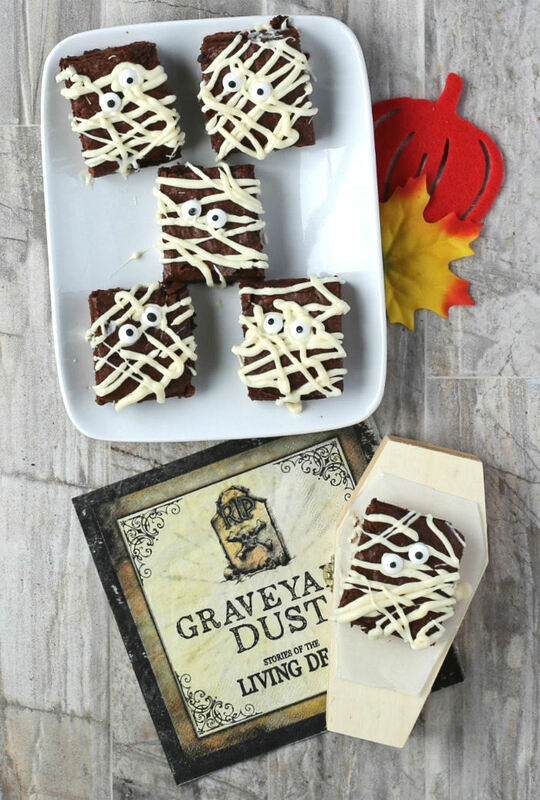 These yummy mummy brownies will be the first sweet treat to disappear from your Halloween dessert table. They are fudgy and whimsical with an eerie kid friendly look. Halloween is a fun time of the year to make holiday themed desserts. Recipes like this are a hit with both the kids and fun loving adults and are usually very easy to make. Mummies are also a favorite Halloween costume for many children. Who doesn’t like being wrapped in white bandages for a fun and scary look for trick or treating? Instead of using cloth bandages to make a mummy, these mummy bandages will be made from melted white chocolate to make your Halloween even more tasty. 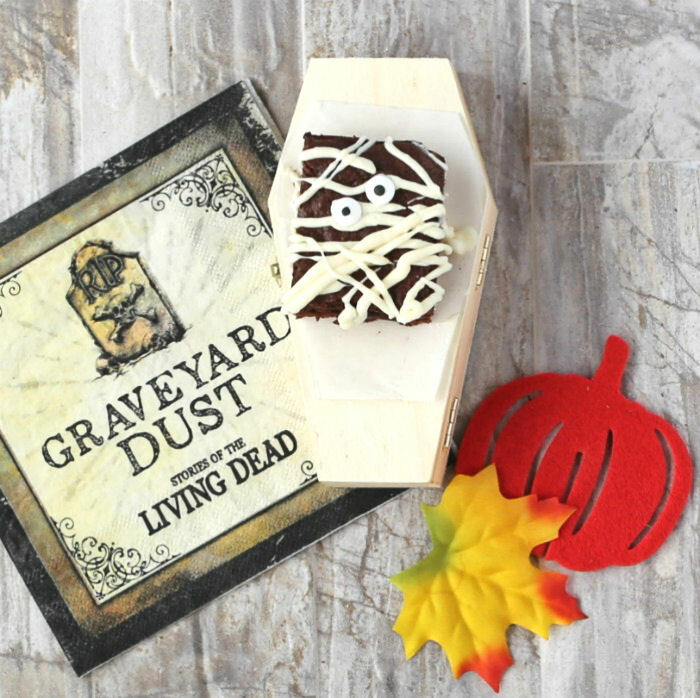 For another fun Mummy dessert, check out these fun mummy truffles. They are also very easy to make. I’ve been on a brownie making frenzy lately. My family loves the taste of them and I’ve been experimenting with all sorts of varieties. These cookie dough brownies are one of my latest creations. 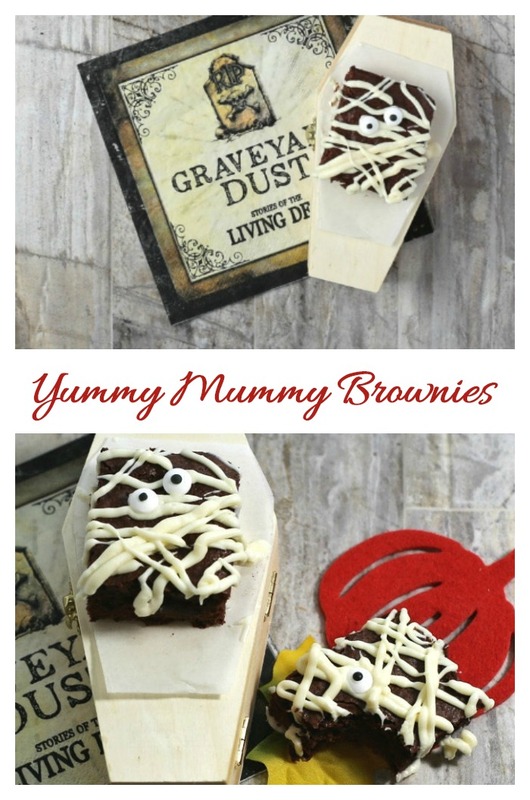 This yummy mummy brownies recipes has a delicious and thick chocolate fudge brownie base and the brownies are decorated with white chocolate bandage stripes and cute edible eyes for a unique and fun look. The ingredients for these fun brownies are just a few. 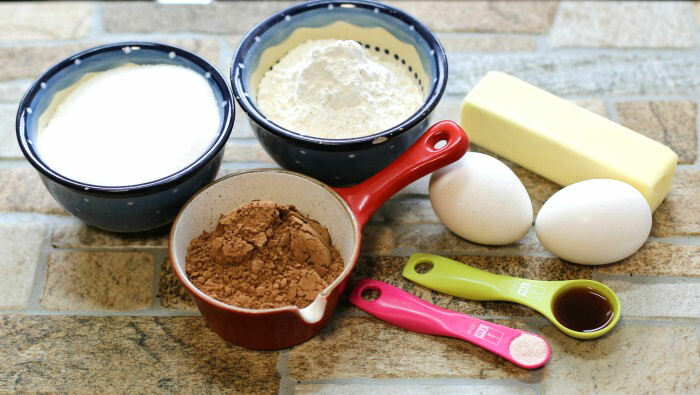 Just combine cocoa, sugar, flour, eggs and butter with salt and vanilla extract. I love that the recipe supplies are all those that I always have on hand in my pantry! This means that I can make them on the fly when my kids tell me that they just NEED something to take to school tomorrow for a party. 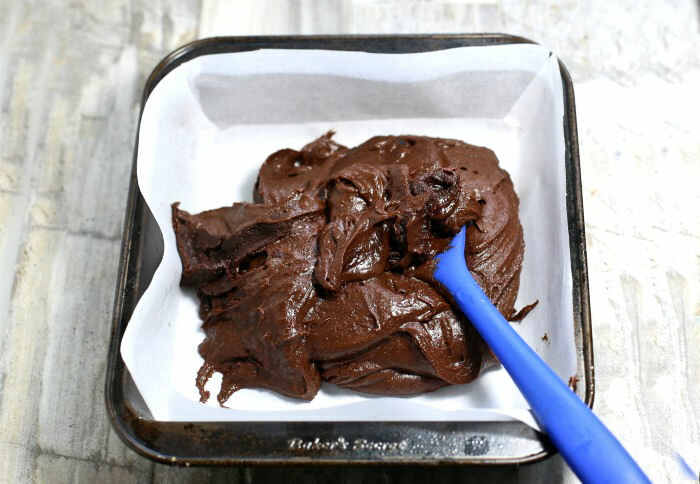 Sure, you can use a box brownie recipe, but the taste of these is so much more moist and delicious and they seriously only take about 5 minutes to prepare so why not go for a home made brownie? Let’s get started on this Halloween dessert treat! 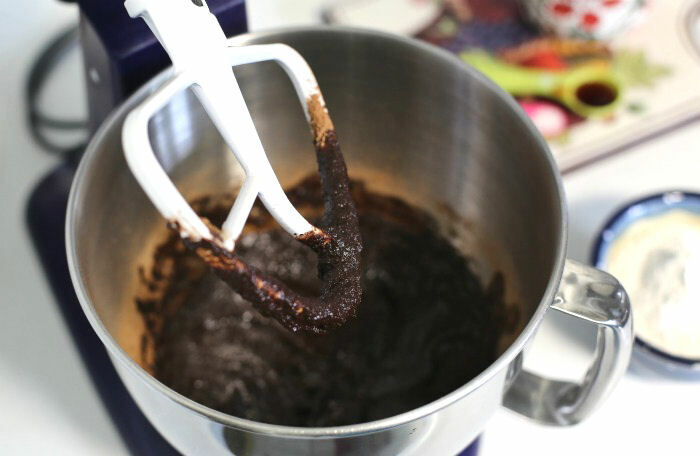 Start your recipe by melting the butter in the microwave and then adding it to the cocoa and sugar in a stand mixer. Mix well until the ingredients are blended. Stir in the eggs, one at a time, and then add the vanilla extract. Look how rich and chocolatey this mixture is. I feel like diving in there right now! The flour and salt get added last. 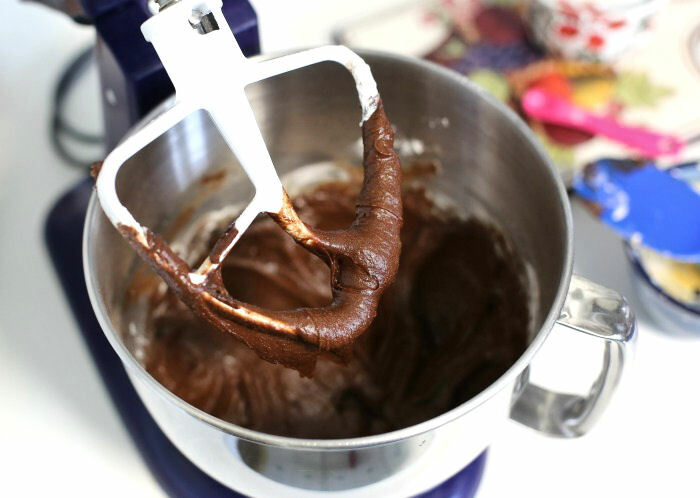 Mix it well but don’t over mix, or the brownies will be too chewy. I used a parchment paper in an 8 x 8 inch pan. Place the batter in it. See how thick and rich it looks? THAT is the reason for making these home made and not using brownie mixes! Bake for 25 minutes until the brownies are done and a toothpick inserted in the center comes out clean. Be sure to allow the brownies to cool completely before you cut and decorate them. Time to make some mummies! The fun part of Halloween recipes like this is decorating them. Be sure to allow your brownies to cool completely and then cut into 9 even sized bars. Separate the brownies to make decorating easier. Place your white chocolate into a bowl and heat in the microwave in 30 second increments until it is melted and creamy. I used vanilla candyquik for melting. White chocolate chips, and Candy Melts will also work. Take care when melting the chocolate. White baking chocolate caramelizes easily (giving it brown specks) if you heat it too much. Go in slow increments and stir after each to prevent this from happening. The melted white chocolate goes into an icing bag. Snip off the end of the bag and pipe the icing ever each brownie with bandage like stripes, being sure to allow the melted chocolate to extend over the sides of the brownies. For the final touch, while the icing is still soft, add two candy eyes to each mummy brownie. Don’t worry too much if the bandages are uneven, and make the eyes slightly lopsided. This adds to the mummy effect! Tada! 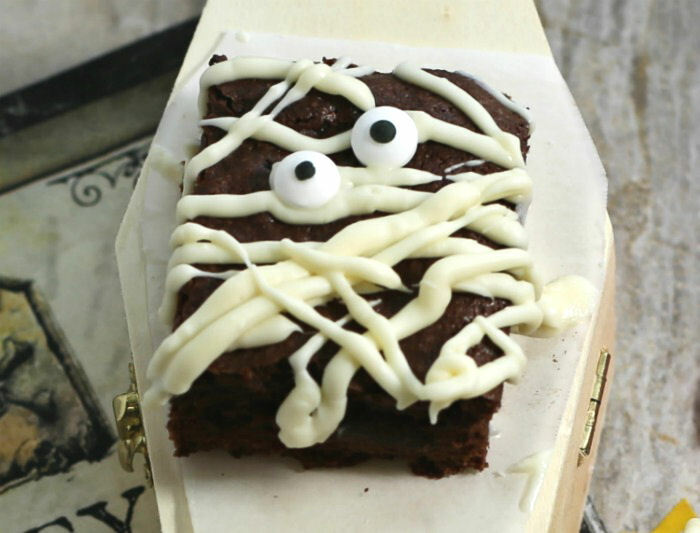 What an adorable Halloween mummy brownie! 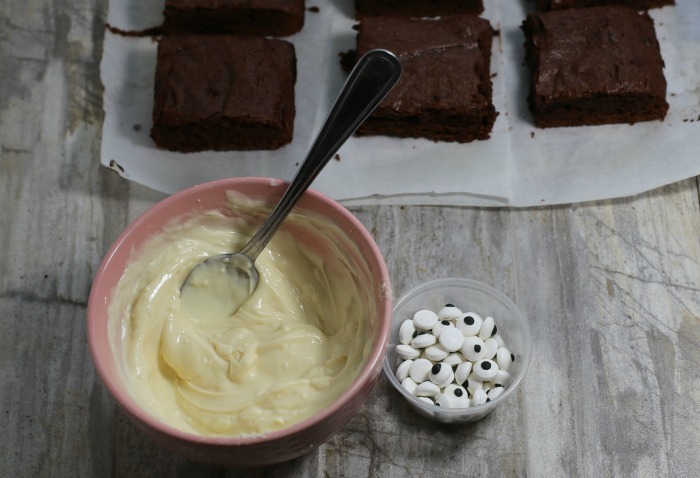 These yummy mummy brownies are a super delicious treat for the whole family. The brownie is rich and fudgy with a deep chocolate flavor and the decadent white chocolate bandages give a creamy finish to the brownie without being too rich. What fun it is to bite into these mummies and gobble up those edible candy eyes! This will be your child’s favorite part of eating these Halloween brownies, I guarantee it! If you are looking for a Halloween sweet treat to take to a pot luck or for your child’s class party, this recipe is for you. It will be a hit, for sure. I cut these brownies into 9 bars, so they are quite large. For this size, each of these mummy brownies has 410 calories. 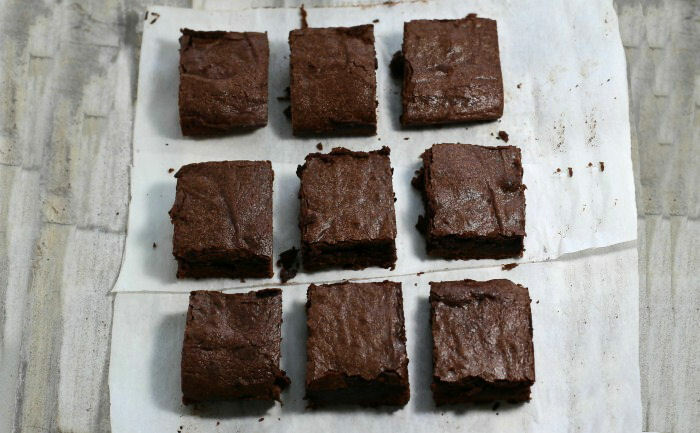 If you cut them into 12 smaller brownies, they’ll have 307 calories each. 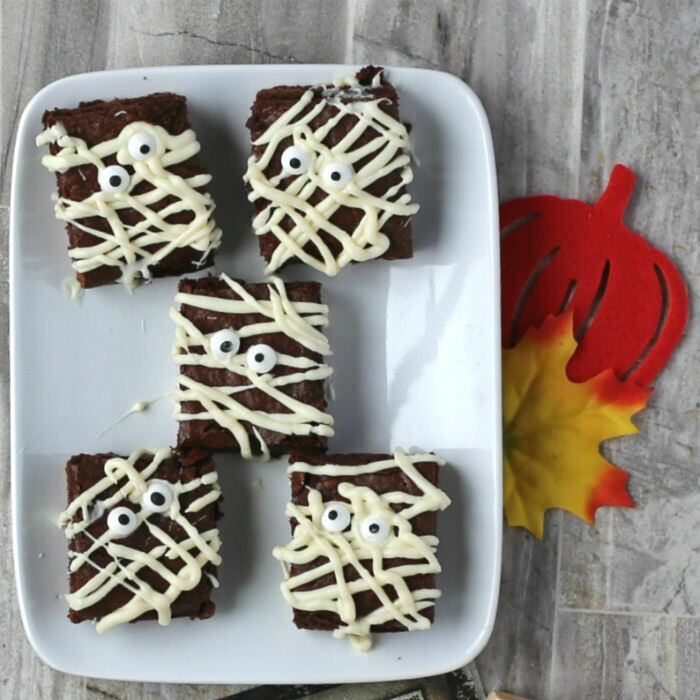 If you would like a reminder of the recipe for these yummy mummy brownies, just pin this image to one of your Pinterest Halloween boards so that you can easily find it later. Want another fun mummy dessert? 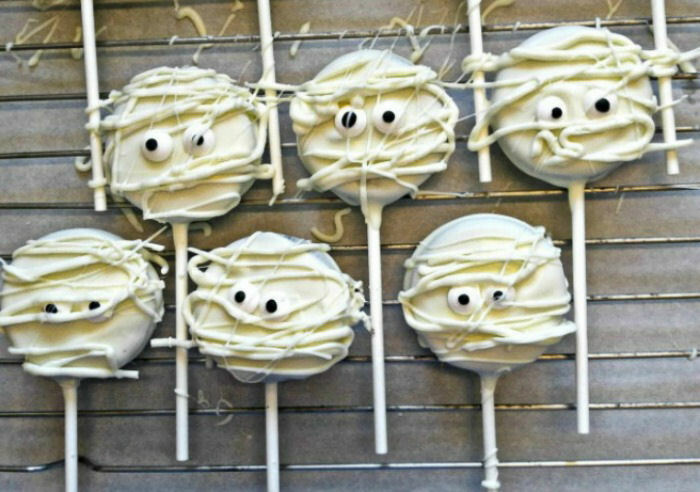 Try these Halloween Oreo Mummy pops. They are easy to make and the kids love them. 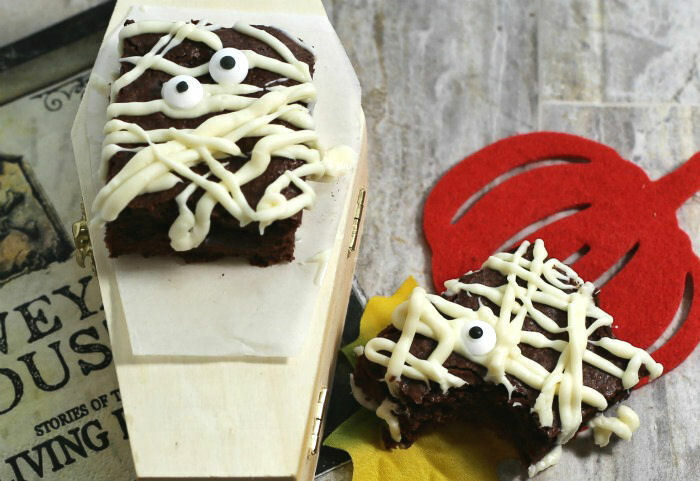 These fun mummy brownies will delight your family. They are super easy to make and will add a fun and whimsical touch to your Halloween dessert table. Preheat the oven to 350°F. 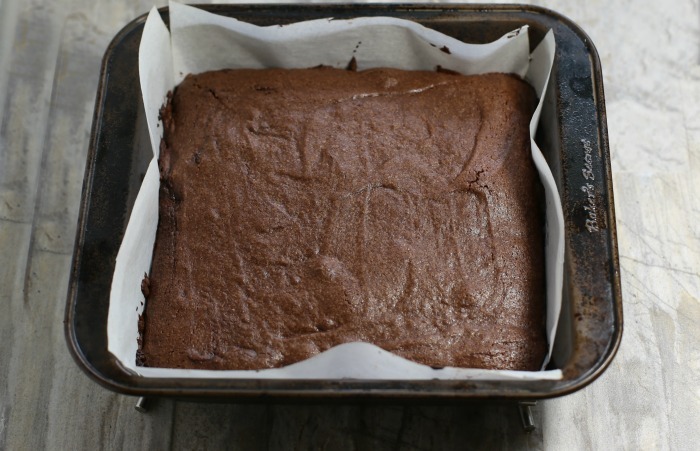 Line an 8 x 8 inch square pan with parchment paper and set aside. 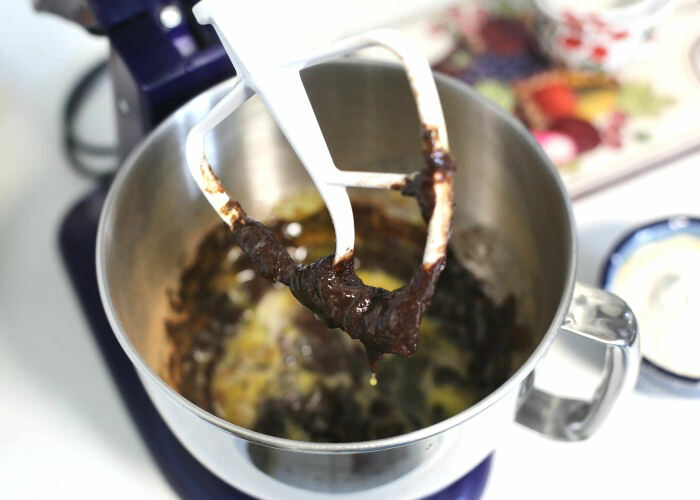 In the bowl of a stand mixer, combine the melted butter, unsweetened cocoa and sugar. Mix well until well combined. Add the eggs one at a time, then the vanilla and mix well. Stir in the flour and salt and mix until the flour is fully combined. Don't over mix or the brownies will be tough. Spread the mixture into the prepared pan and bake for approximately 25 minutes or until toothpick inserted in the center comes out clean. Be careful not to over-bake or they will be dry! Cool completely then cut into 9 squares. Place the white chocolate into a bowl and heat in the Microwave. Cook in 30 second increments until the chocolate has melted stirring between each heating..
Place in an icing bag and pipe over the top of each brownie, mummy style, allowing the melted chocolate to drip over the sides of the brownies. 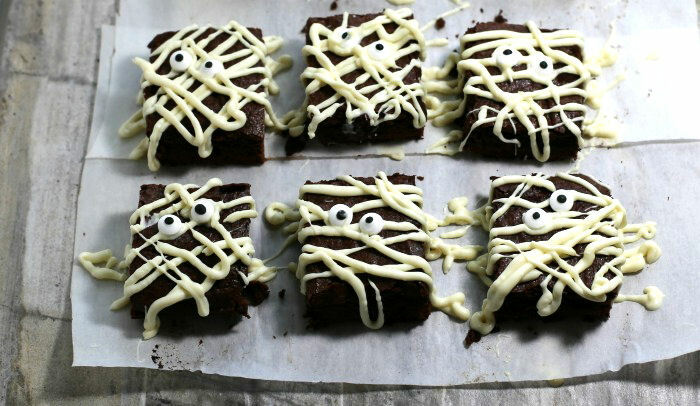 While the icing is still soft, add two candy eyes to each mummy brownie.